US 566 went west from there, through Carrizozo, and ended at its junction with US 85 in San Antonio. But the map of the US highway system in these parts was drastically redrawn in 1932. US 70 was rerouted such that it ran through Clovis to El Paso. That change, along with a westward extension of US 60, rendered superfluous the US 366 [i] designation. A new US route was created, running east from Roswell into Texas. This route could have been considered an eastward extension of US 566, but instead the entire thing was designated US 380. It was an appropriate change, because this highway no longer connected with another route in the x66 family. 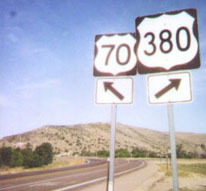 So the west beginning of US 566 became the west beginning of US 380. That remained the case for about 30 years, until I-25 was built through the state.